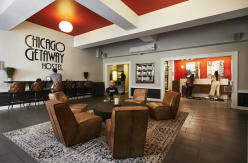 Welcome to Chicago Getaway Hostel located in the heart of Chicago’s Lincoln Park neighborhood. 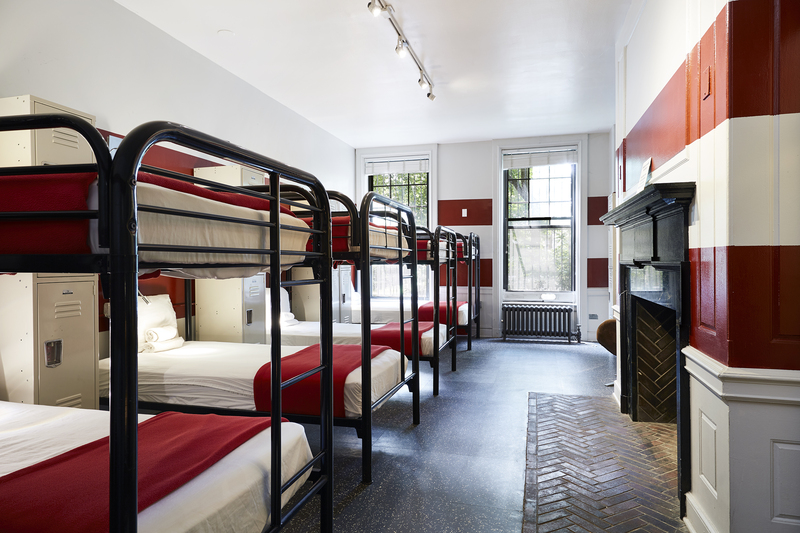 Our hostel features 115 rooms and accommodates up to 338 guests. 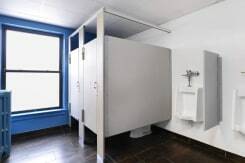 We have a wide variety of room offerings from large dorms to intimate private rooms, many with en-suite bathrooms. Our neighborhood is full of great restaurants, pubs, music venues and is along the banks of Lake Michigan. The historic Lincoln Park zoo is located a short walk away, as is DePaul University and let’s not forget the wonderful beaches nearby. We offer a great atmosphere with outings daily to places like Kingston Mines – a great blues club to our regular pub crawls, comedy nights, free meals & BBQ’s, bike rides and a whole lot more. We’re always trying to save you money and time and offer many discounted attraction passes, transit passes and the ability to keep your workout routine while on the move. 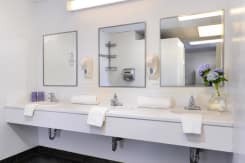 We also offer private parking on site, free housekeeping service, linens and towels and complimentary fast WI-FI around the building. You’ll love our free daily breakfast featuring items that appeal to kosher, gluten free and daily free diets. We have hot food too, including scrambled eggs and make- your- own- waffles. Our restaurant grade kitchen features everything you’ll need to make a gourmet meal – and for those of you who like to grill outdoors, we have you covered there too. Our staff all knows and loves the city of Chicago – this will enable you to experience Chicago like a local! We look forward to welcoming you soon! - 7 days Cancellation policy. - We cannot guarantee bunk bed placement(top or bottom). - Minimum Age to register in dorms is 18. 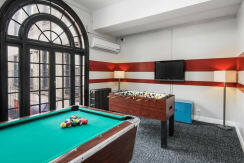 - Guests under 18 are welcome in our private rooms while accompanied by a guest 21 years or older. - Guests residing in a US zip code that begins with “60” will not be permitted. - Taxes of 17.4% will be added to the “due at arrival” fee on your confirmation. - We have a maximum stay of 14 nights. 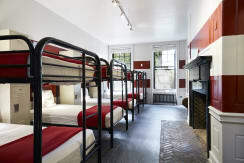 - We cannot guarantee bunk bed placement (top or bottom). Take the Blue Line to the Jackson stop, transfer to the Red Line towards Howard, exit at Fullerton, walk east on Fullerton, turn left on Orchard, walk one block and turn right on Arlington, Chicago Getaway Hostel is on left. 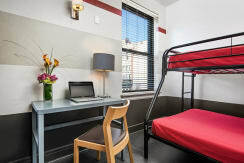 Take the Orange Line train to Roosevelt stop, transfer to the Red Line subway towards Howard, exit at the Fullerton stop, walk east on Fullerton, turn left on Orchard, walk one block and turn right on Arlington, Chicago Getaway Hostel is on left. Take any bus East on Jackson to Dearborn, take either #22 or #36 bus North to Arlington and Clark, walk across the street to Arlington Place and walk west 1 1/4 blocks to 616 West Arlington Place. Walk to Halsted (west two blocks), take bus #8 to Fullerton, walk east on Fullerton, turn left on Orchard, walk one block and turn right on Arlington, hostel is on left. Welcome to Lincoln Park a lovely neighborhood just north of the downtown loop. You'll find lovely tree lined streets, large mansions and incredible access to Lincoln Park featuring a free zoo, beaches, conservatory, and the nature walk. Lincoln Park is also the home of comedy with Second City, Live Music Venues and great restaurants of every ethnicity and price. Chicago is very accessible with public transit and we're near the Chicago Cubs! Experience Chicago like a local.